Science textbooks challenge many students. Miller & Levine Biology accommodates students’ different learning styles, interests, and abilities. From critical reading and study support to world-class interactive content, this is a biology curriculum that builds confidence and curiosity. Students are encouraged to investigate, explain, and apply scientific practices. 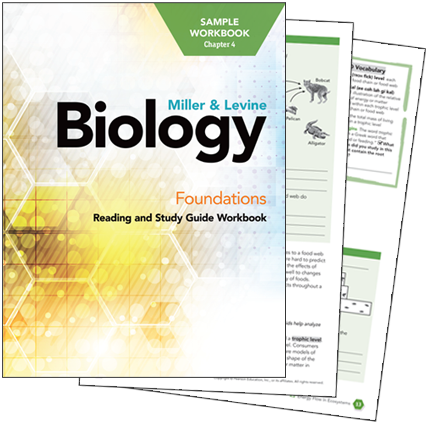 Ken Miller wants to do away with "boring"
Biology Foundations: Reading and Study Guide Workbook includes lesson summaries, vocabulary help, and reading tools. 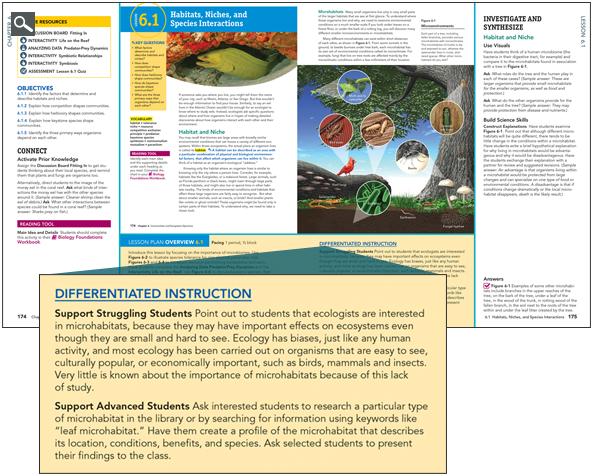 Practice focuses on key concepts and science literacy to improve students’ understanding of scientific text. Lessons Summaries: simplify critical ideas. Vocabulary Practice: focuses on key biology terms. Reading Tools: reinforce comprehension strategies. Visual Reading Tools support difficult concepts with interactive visuals and alternative practice opportunities. Chapter Reviews: provide practice and self-monitoring. 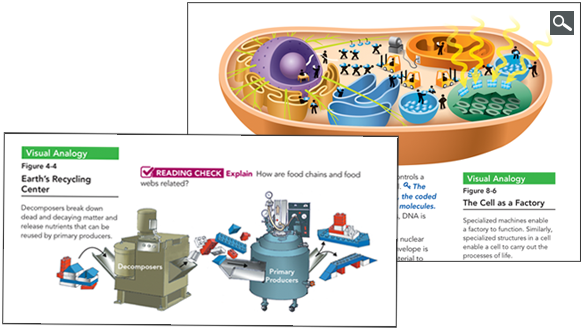 Visual Analogies, dynamic photos, illustrations, diagrams, and infographics help students understand each chapters' core ideas. Visuals make the content more comprehensible and enjoyable. The online digital course is on PearsonRealize.com. 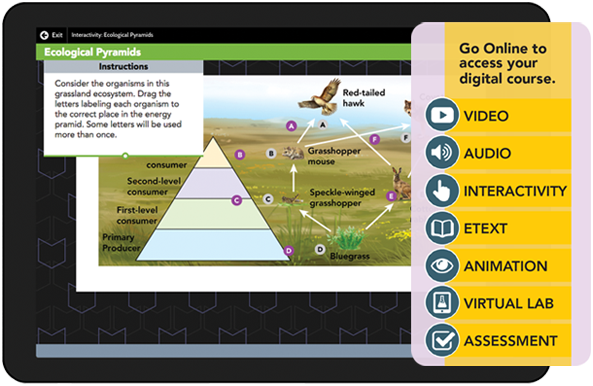 Videos, animations, audio, and virtual labs encourage students to interact with the content. When students are actively involved, they learn better and see the content as relevant. 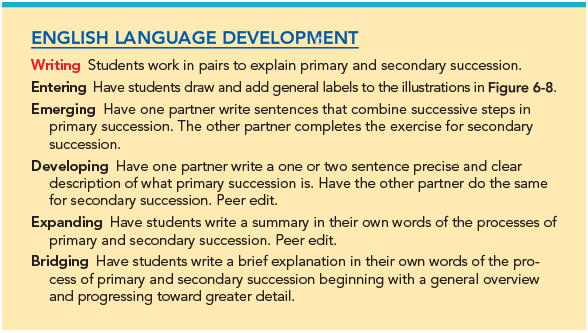 ELD strategies in the accompany the lessons in the Teacher Edition, so you can address student needs on the spot. The program includes reading, writing, speaking and listening activities for English learners. Support the ELD Standards across five levels of proficiency: Entering, Emerging, Developing, Expanding, and Bridging. Modified instruction allows teachers to address special needs students, struggling students, less proficient readers, and advanced learners. Teachers can use instructional strategies in the margins to fully differentiate instruction.